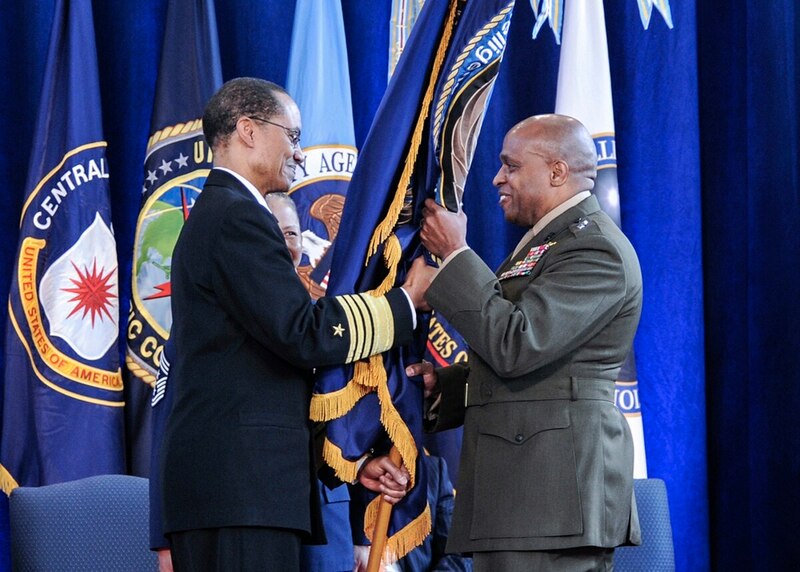 Marine Corps Lt. Gen. Vincent Stewart assumes command of the Joint Functional Component Command for Intelligence, Surveillance and Reconnaissance from U.S. Strategic Command Commander Adm. Cecil Haney in a Jan. 23 ceremony at Defense Intelligence Agency headquarters. WASHINGTON — The U.S. defense intelligence chief warned Tuesday that America's technological edge over China is at risk because of cyber theft. Lt. Gen. Vincent Stewart, director of the U.S. Defense Intelligence Agency, told a congressional hearing the U.S. retains technological superiority. But he said China had stolen "a lot" of intellectual property from U.S. defense contractors and that effort continues. He's declined to say publicly whether that has affected U.S. defense capabilities. "I do not believe we are at this point losing our technological edge, but it is at risk based on some of their cyber activities," Stewart told a House Armed Services Committee hearing on worldwide threats. Stewart's comments underscored the strains between the U.S. and China over cyber espionage. Last May, U.S. authorities indicted five Chinese military officials over allegations they targeted big-name American makers of nuclear and solar technology. Then in September, the Senate Armed Services Committee reported that hackers associated with the Chinese government repeatedly penetrated the computer systems of the U.S. Transportation Command, showing vulnerabilities in the U.S. military's system to deploy troops and equipment in a crisis. Beyond the cyber tensions, China's military buildup poses a challenge to America's post-World War II predominance in the Asia-Pacific region, although both the U.S. and China have sought to tamp down talk of rivalry between the established world power and the rising one. Stewart told lawmakers that China was designing their forces to counter the U.S. military, and Chinese training and weaponry, including missiles, aircraft and space defense capabilities, pose a "significant threat" to U.S.forces in the western Pacific. His written testimony noted China's increasing power projection in the Indian Ocean, with two submarine deployments there in 2014, and modernization of its air force "on a scale unprecedented in its history." He said China is deploying growing numbers of an anti-ship ballistic missile — which analysts have said pose a potential threat to American aircraft carriers. Stewart said China also has two stealth fighter jet programs, and is developing a missile defense system.